In 1872, anti-abortion feminist Victoria Claflin Woodhull became the first woman to be nominated and to run for President of the United States. 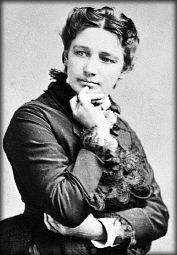 Victoria Claflin Woodhull (1838-1927) was a popular and controversial figure in her day. She was a prominent speaker, writer, and activist for women’s rights; one of the first women stockbrokers; and a newspaper publisher. Woodhull and her sister Tennessee Claflin opened Woodhull, Claflin & Co., Bankers and Brokers, in New York in 1870. Their radical political reform newspaper, Woodhull & Claflin’s Weekly, began publication the same year and continued for six. Every one will concede that it is murder to take the life of a human being. But the very pertinent question arises just here, when does human life begin? The beating of the heart, modern science tells us, never begins; that is to say, there is no time in the whole process of the growth of the human body from the moment of conception until death, that pulsations of life are not present in what is to develop into the perfected body. Where, then, shall the line be drawn, on one side of which it shall be murder to cause these pulsations to cease, and upon the other not murder? …Many women who would be shocked at the very thought of killing their children after birth, deliberately destroy them previously. If there is any difference in the actual crime we should be glad to have those who practice the latter, point it out. The truth of the matter is that it is just as much a murder to destroy life in its embryotic condition, as it is to destroy it after the fully developed form is attained, for it is the self-same life that is taken. …[T]hey who, having conceived [children] then destroy them, are murderers; and no amount of sophistry nor excuses can, by one iota, mitigate the enormity of the crime. They do even more than murder, they virtually commit suicide, for no woman can practice this crime without in part destroying her own life. …[W]hile we shall at all times freely discuss the matter, objectively as to its results, we shall not forget to look at the matter subjectively, to find the remedy, which, if we mistake not, is in granting freedom and equality to woman. If there is one fact in modern society, more horrible, and at the same time more sorrowful, than any other fact, it is that one which relates to the death-rate among the young from the time of conception up to five years of age. It is one of those things against which almost everybody willfully shuts his eyes and professes to think that it does not exist; and everybody pretends to everybody else that he knows nothing about it; while on every hand — in every household — the young drop off like leaves before the autumn wind…. [T]his enforced ignoring of one of the horrible facts of modern society is engendering in society itself a morbid condition of mind regarding children which, if not speedily checked, will prove fatal to civilization itself….It is with this fact in our experience as it is with all other facts. Its first effects are visited upon the innocent young — its objects; but, secondarily, the effects react upon their subjects and work their utter demoralization…. No matter how much is gained, for the person, by any act, if it not be in accordance with the law of justice it will come home to its subject and be repaid with all its accumulated mass of inhumanity…. Humanity when it comes to a knowledge of this law, will be ready to become a brotherhood. It is from this view of the subject that the treatment given by the present generation to its children is to be specifically deplored. It not only slaughters them with unthought of rapidity, but through its reactionary influence it is causing an involuntary suicide to settle over the fair face of humanity, which will eventually sweep off the race as though a pestilence were holding a high carnival. …[This generation] is seemingly indifferent to the life or death of its young. Its practices cut them down like grass before the scythe. Parents deposit one-half of their young in the grave-yards before they reach the age of five years…. Childhood ought to be the healthiest period of life; but in our condition it has degenerated until it is ten times more fatal than any other period. And yet we talk of the sacredness of human life as if it were so regarded by all! A human life is a human life whether it be a day or a century old; and that custom which cuts off one-half of the young almost in infancy, is as virtually murder as would be the same death-rate among adults resulting from compelling them to the use of life-destroying food. …If parents should fail to send their children to school when there are good schools provided for them, and as a consequence they should grow up in ignorance, and be incapable of entering upon a profitable citizenship, such parents would be justly responsible for the fact; then how much more should they be responsible for this failure to so rear their children — when they know they have a right to life, and that by proper care they would have it — that they may enjoy the blessings of health and a common length of life. It is not only a fact that this terrible death-rate persistently continues among children, but that there is still another death method not included in its horrible details, which, if possible, is still more revolting, and which is none the less a slaughter of the innocents.It is a well authenticated fact established by statistics, that as civilization evolves — that as enlightenment becomes the rule among the people — abortions increase. Wives deliberately permit themselves to become pregnant of children and then, to prevent becoming mothers, as deliberately murder them while yet in their wombs. Can there be a more demoralized condition than this? …Some wives procure a half dozen abortions per year…. If this practice prevail so widely among wives, who have no need to resort to it “to hide their shame,” but merely to prevent an increase in the number of their children, how prevalent must it be among the unmarried class who have social death staring them in the face when they become pregnant without the consent of the canting priest or the drunken squire? Nor must it be inferred that the crime of abortion is confined to the large cities…. [T]his pestilence runs riotous everywhere. Not long since we were in a small town — a county seat — of five thousand inhabitants in Michigan, where a prominent physician — a reliable man — informed us that upon that day he had been importuned by six different wives of the place to procure abortions…. What a comment upon modern society is this! …We are aware that many women attempt to excuse themselves for procuring abortions, upon the ground that it is not murder. But the fact of resort to this argument only shows the more palpably that they fully realize the enormity of the crime. Is it not equally destroying the would-be future oak, to crush the sprout before it pushes its head above the sod, as it is to cut down the sapling, or to saw down the tree? Is it not equally to destroy life, to crush it in its very germ, and to take it when the germ has evolved to any given point in the line of its development? Abortion is only a symptom of a more deep-seated disorder of the social state. It cannot be put down by law. Normally the mother of ten children is as healthy, and may be as youthful and beautiful, as a healthy maiden. Childbearing is not a disease, but a beautiful office of nature. But to our faded-out, sickly, exhausted type of women, it is a fearful ordeal. Nearly every child born is an unwelcome guest. Abortion is the choice of evils for such women.Is there, then, no remedy for all this bad state of things? None, I solemnly believe; none, by means of repression and law. I believe there is no other remedy possible but freedom in the social sphere…. Freedom is a great panacea. It will be when women are thrown more on their own resources, when they mingle on more equal terms with men, when they are aroused to enterprise and developed in their intellects; when, in a word, a new sort of life is devised through freedom, that we can recover the lost ground of virtue, coupled with the advantages of the more advanced age. Feminists for Life especially welcomes women and men who have personally experienced abortion or whose lives have been affected by abortion to join in this mission to eradicate the root causes that make women feel as if they have no other choice. Women deserve better.